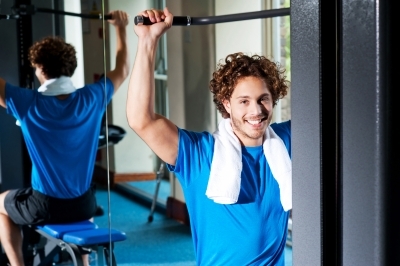 In the eyes of many, personal fitness training is viewed as a glamour job. Who wouldn’t love to wear stretch lycra and sneakers all day long, while chatting it up with athletes, luminaries and big wigs? But the truth is that personal training is hard, sweaty, dirty manual labor. Sure we love it, but it is not a career for the pampered masses. If you want to be a successful trainer with a full client load, prepare to spend hours each day demonstrating exercises and possibly teaching classes. You will literally lift tons of weight, lie on dirty floors, wipe up the sweat of strangers, hold your bladder until it aches, skip meals, and talk yourself hoarse. And you will be a prime candidate for overtraining syndrome. Overtraining syndrome occurs as a result of an ongoing high volume training schedule with inadequate rest and recovery. The syndrome is commonly associated with elite athletes, but it is rampant in the fitness community. Symptoms are both physiological and psychological. According to researchers Kravitz and Kinucan at the University of New Mexico, early signs of overtraining syndrome include moodiness, depression, apathy and decreased motivation. In advanced stages, the immune system becomes suppressed and flu-like symptoms that include upper respiratory infection, achy muscles and joints, digestive distress, and fatigue begin to manifest. Weight loss, weight gain, disruption of sleep, decreased performance and increased blood pressure may occur. In women, amenorrhea is common. It is not uncommon for trainers to get up before the crack of dawn to meet with clients before their work day begins, and to leave the gym well after dark. By the time you get home, walk the dog, put the kids to bed and bathe yourself, you may be left with very little time for sleep. According to Researcher Cheri Mah of the Stanford Sleep Disorders Clinic and Research Laboratory, chronic sleep deprivation can result in decreased physical performance, impaired cognitive functioning, moodiness, and reduced reaction time. Coupled with over-training, sleep deprivation can send you into a downward spiral that could potentially destroy your career. Practicing balance in your daily job performance and in your life in general is important if you are to function at optimal levels. When demonstrating exercises and racking weights, make every effort to alternately load the left and right sides of your body. Take time to stretch throughout the day. Work periodic breaks into your daily schedule, and use them to nap or relax. Make sleep and self-care a priority. Eat wholesome foods at regular intervals throughout the day, drink plenty of water and take frequent bathroom breaks. Recognize early signs of overtraining syndrome in yourself, and take time off when you need it. To learn more, consider enrolling in W.I.T.S Lifestyle Fitness Coaching, Nutritional Concepts and Personal Trainer Foundations courses, all available online. University of New Mexico: Overtraining: Undermining Success? The Huffington Post: Sleep And High Performance: What Olympic Athletes Know About Sleep.